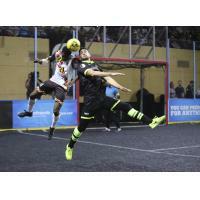 Baltimore, MD - In the first matchup between the Blast and Wave, the Baltimore Blast were defeated by the Milwaukee Wave 4-2. Both teams implemented a defensive style and patient build-up play, but the Wave ultimately prevailed. The Wave got off to a fast start as Angel Curiel scored his sixth goal of the season. For most of the first quarter, both teams would have plenty of possession. The Blast would have several shots hit the top of the boards and eventually found the back of the net through Sam Guernsey's third goal of the season. Ian Bennett would score an easy tap-in for the Wave with under a minute remaining to put the Wave ahead 2-1 at the end of the first quarter. The second quarter showcased how good both goalkeepers are in the league. Both teams had plenty of chances on goal, but Josh Lemos and William Vanzela stood firm to keep the game at 2-1. The two teams would trade possession of the ball throughout the second quarter, but the game would remain 2-1 Wave at the end of the second quarter. The third quarter featured a defensive battle where, again, both defenses shut out the opposing offenses opportunities. The Blast would equalize with two minutes remaining in the third through Sylla Salifou. Salifou stole the ball from the Wave defense and immediately fired a shot past an out-of-position Lemos. Seconds later, the Wave would regain the lead with a power play goal from Drew Ruggles. Ruggles was assisted by Max Ferdinand, who recorded his second assist of the game. The Blast would end the third quarter on the penalty kill and trailing 3-2. Luan Oliveira would extend the Wave's lead to 4-2 with seconds remaining on the power play. Ferdinand would complete a hat-trick of assists on Oliveira's goal. The Blast continued their style of patient build-up play throughout the fourth quarter, but the Wave defense held strong. The Blast would insert Tony Donatelli as the extra attacker with four minutes remaining in regulation. The Blast would craft several chances throughout the final four minutes, but could not break the Wave defense. The Blast ultimately could not score any more goals and were defeated by the Wave 4-2. The Blast were led by Salifou, Shipalane, and Guernsey, all of which scored one point in the game. Max Ferdinand compiled three points for the Wave; all of which were assists. William Vanzela would record ten saves in the losing effort, while Josh Lemos compiled eleven saves for the Wave. The Blast fall to 7-4 on the season and will face Utica City FC back home next weekend. The Wave improved to 10-2 on the season and will face the Florida Tropics at home next weekend. The Blast are back in action on Friday, February 8th at 7:30 P.M. when they come back home to SECU Arena to face Utica City FC.